In our most recent blog we discussed some of the best ways to save water in the Denver area, changes that are so easy that you don’t even need to call your local plumber to make them happen. These included replacing your lawn with xeriscaping so that you don’t need to use water, replacing your thirsty grass with grass that does better in an arid climate, collecting rain in rain barrels and using it to water, and keeping an eye on your water bill to watch for spikes that could indicate a hidden leak. This week we’re going to suggest a few changes that can save you even more water, and therefore more money. If the store you buy from doesn’t do installations, call for our plumbing services and Garvin’s will be there to help you install your new appliance. 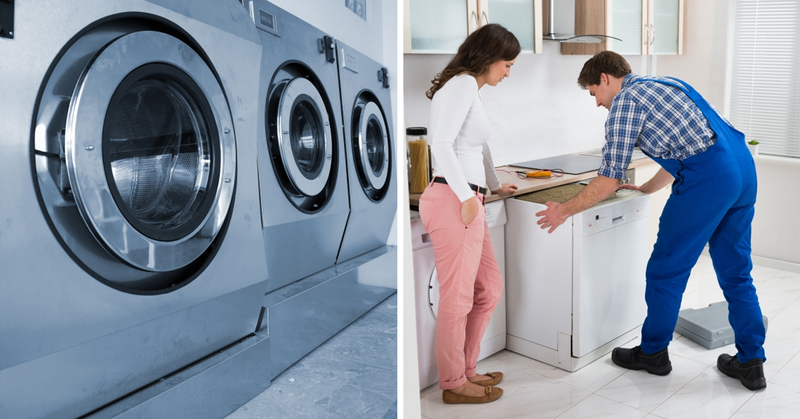 Older top loading washing machines can use 40 or 50 gallons per wash cycle. Newer front loading washing machines can use as little as 10 gallons (reducing your water bill). No agitators in front loading machines and less time in the dryer means your clothes will last longer (reducing your clothing budget). Less water used means less water needs to be treated at the water treatment plant. Oh, and here’s a bonus tip: stop washing clothes that aren’t dirty! Sure, you need to wash your underwear and your workout clothes every day. But jeans can be worn at least a couple of days before it’s time to wash them, as can that shirt that you only wore for two hours last night. Avoiding washing the clothes too much also means that you’ll put less wear and tear on your washing machine and the clothes. Some studies show that washing dishes by hand saves you water. Other studies show the opposite. Either way it’s unlikely you’ll spend an extra 20 minutes a day to give up your dishwasher! If you have an old dishwasher, it might be costing you more than it’s worth on your water and power bills. Newer dishwashers are surprisingly energy and water efficiency, using less than four gallons of water per wash cycle. That old dishwasher could be an energy hog and be using upwards of six gallons of water per cycle, even more if it’s really old. And if it’s really old, you’re also more likely to have leaks. The next time you dishwasher goes on the fritz and you consider repairing it, think about the water savings you’ll experience by purchasing a new one. Those two simple upgrades will end up saving you water, power, and will help the environment. It’s a win-win-win that shouldn’t be ignored. And if you need help with installation, contact Garvin’s!